As of yesterday, I am now the newest member of the Daughters of the Union Veterans of the Civil War! Three months ago, I did not know it was even a thing. Now, I am a proud member. I attended Gene-a-Rama in Wisconsin Dells, Wisconsin in April to help advertise for the Dane County Area Genealogical Society and to network and learn from other genealogists. During some down time, I walked around the exhibit area and came across a table for DUVCW. I remember doing a double take and reading the sign, trying to figure out what it was all about. The woman asked if I had an ancestor who fought in the Civil War. I said that I did and I wanted to learn more about the group. She gave me the membership registration form and told me to look at the website. 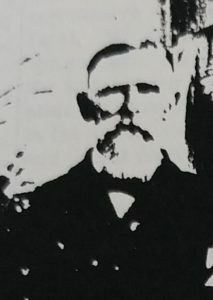 Thomas Carlon was born in County Cavan, Ireland in 1827. He immigrated to America in 1852, coming through Castle Garden. He made his way to Minnesota, where he settled in a small town 23 miles north of Rochester, Minnesota. Mazeppa, the small town, was the focal point of many of my ancestors on my mother’s side. It is a small farming community which looks like a ghost town every time I have been there (well, except for this one Memorial Day, which was a zoo compared to the other 30+ times I have been there). Thomas enlisted in the Civil War on February 1, 1862 at Fort Snelling, Minnesota. Fort Snelling is one of my favorite places in the entire world. I spent every Fourth of July at that historic site growing up. Whenever I was there, it seemed like it was a beautiful day, with breath-taking views of the woods and flowing river that surrounds the fort. When I learned that my ancestor was there at one point, it was incredibly exciting! 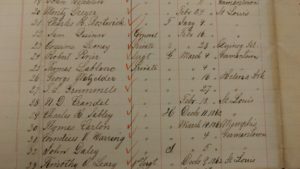 Thomas Carlon in Minnesota Civil War Records, Fifth Volunteer Company H. Picture taken at Minnesota Historical Society. He became a Private in the Minnesota 5th Company H was with the company for approximately 18 months, when he was mustered out while in Tennessee. It was on the grounds of a disability dealing with a lung condition. One thing that I have found interesting with my search thus far is that there is little written on his particular company. I spent an afternoon at the Minnesota Historical Society and found only three items that pertain to Company H: the monthly summaries and two diaries of soldiers who were in the company either towards the end of Thomas’ service or after he had returned to Minnesota. In order to become a member of this society, the process was pretty simple. The key is to have proof that you are related to the soldier. In order to do that, you need to have a paper trail from the soldier to you. I used birth, marriage, death, and war records to prove that I am descended from Thomas Carlon. The leader of the unit gave me a worksheet to fill out and to return to her. She looked it over, along with my evidence, and said that I had all the proof that I needed! From there, I filled out the official forms and mailed off the paperwork. To be a member, the dues are $30 a year! That’s a bargain in my book! I registered myself for this for two reasons. First, to give credit where credit is due. The Carlons are hardworking people who have not received much acknowledgement for their efforts and accomplishments. I thought it was about time that somebody recognized it, no matter how many “great”s are between Thomas and me! The second reason is to help me understand the process for helping clients go through any society registration such as this. If you need any help to take part in this process, please feel free to contact me through my website! ← I Have Matches on Ancestry. Now What?